Guido Alberto Fano began studying music at the age of nine, under the guidance of Vittorio Orefice, choir master and conductor in Padua, who gave him his first piano lessons and who brought him into contact with stage-life and with directing orchestras and choirs. About him, Orefice wrote: "I realized that the exceptional gifts with which he is blessed and his rare genius are such that they leave one in no doubt about his future splendid success as a pianist and musician." At the age of 16, his first teacher, always dear to him, entrusted him to the care of Cesare Pollini, director of the Musical Institute of Padova, and court pianist of Her Majesty the Queen Mother. He studied witn Pollini intensively for four years, to the point where he acquired "a perfect theoretical knowledge of and practical skill in piano playing", as Pollini himself wrote some years later. During this period he studied a great deal of chamber music and started to play in public, both at private musical evenings and at public concerts in Veneto and elsewhere. He met Antonio Bazzini, who liked his first compositions, and Riccardo Drigo, who recognized in him "all those gifts which assure great success in an artistic career", adding also that "certainly one day Fano will occupy an elevated position in music". In 1894 he went to Bologna, for an audition with Giuseppe Martucci, who immediately took him as his student in piano and composition. In only three years he finished his course in composition, under the guidance of Cesare Dall'Olio for harmony, counterpoint and fugue, of Luigi Torchi for the history and aesthetics of music, and of Martucci himself for composition and conducting. He received his diploma in music with First Class Honours, which had not been given before in the previous ten years, during which Martucci had directed the "Liceo Musicale" in Bologna. In this period he composed his first symphonic pieces: the Preludio Sinfonico and Introduzione, Lento fugato, Allegro appassionato, which merited the dedication from Martucci "To my favourite scholar Guido Alberto Fano". In 1897, thanks to Martucci's involvement, he went to Germany, where he studied in Ratisbon, Nurenberg, Baireuth and Munich. He met Richard Strauss, who liked his compositions and his style of piano playing. 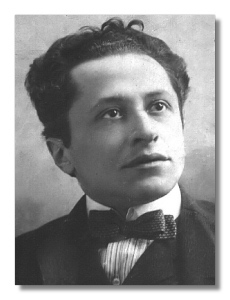 In 1900 he was in Vienna, where he participated in the "Rubinstein International Competition", where he obtained a special mention for his Fantasie for piano, for the Sonata per pianoforte e violoncello, a composition which had been farmerly awakded with the first prize at the competition of the "Società del Quartetto" of Milan in 1898, and for the Andante e Allegro con fuoco for piano and orchestra. In 1901 he obtained a Degree in Law from the University of Bologna, with the thesis "About the reproduction by means of mechanical musical instruments and the relationship with copyright". During these years he met Arturo Toscanini, who, according to Fano's own memoirs said about his compositions: "This music deserves to be known, and I want to be the first at conducting and spreading it"; but, unfortunately, this project never came off. At the same time, he had been seeing the poets Giosuè Carducci and Gabriele D'Annunzio, for whom he wrote the music for some of their lyrics. In 1904 and 1905 he went back to Germany, this time to Berlin, where he played in concert tour, alone and in a Trio with the Bertani cousins who played the violin and cello. In Berlin he met Ferruccio Busoni, who offered him the possibility of becoming piano teacher at the Conservatory of Chicago, but Fano refused the proposal. Instead, he was planning to leave his job as a piano teacher at the "Liceo Musicale" in Bologna and to organize a big concert tour in Europe. However, in 1905 he obtained a post as Director of the Conservatory of Parma from among a group of 36 candidates, who were examined by a commitee presided over by Toscanini. Between 1906 and 1908 he conducted two opera seasons, in Parma and in Reggio Emilia. Among others, he conducted Walkiria, Lohengrin and Parsifal, Aïda, Traviata and Wally. In 1911 he was offered a post as a teacher and "virtuoso" in piano music by the College of music of Cincinnati (Ohio, U.S.A.), but, once again, he decided to remain in Italy and declined the proposal. He therefore stayed in Parma until 1912, when he was assigned the Directorship of the Conservatory "S.Pietro a Maiella" in Naples, a post which had remained vacant since the death of the former director, Martucci, in 1909. He remained in Naples until 1916, when he was forced to move to Palermo, against his will, as a consequence of his attempts at reforming the Neapolitan school. In Palermo he conducted numerous symphony concerts and continued his work as a promoter of musical culture and life. In 1922, still not resigned to remaining in that post, which he considered "a place where one can go to rack and ruin, and the end for a musician" he asked for and was able to regain a post as a piano teacher at the Conservatory of Milan. He occupied this position until 1938, when he lost the job because of the racist laws passed by the Fascists. Between the two wars, he dedicated himself almost entirely to playing and teaching, leaving aside his activities as a composer. He spent the war years as a refugee with his family at Fossombrone and Assisi. He went back to Milan at the end of the war, and he remained there until he died, in 1961, while he was having a holiday at Tauriano di Spilimbergo, in the province of Udine.